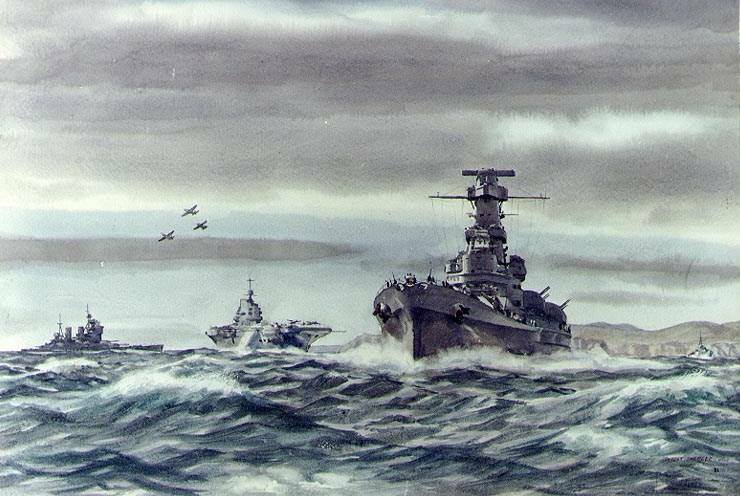 “Taks Force of Two Navies” Watercolor by Dwight Shepler, USNR, 1943, depicting U.S. and British warships in the Pentlant Firth during an operation toward the Norwegian coast, coincident with the Sicily invasion, July 1943. Alabama (BB 60) is in the lead, followed by HMS Illustrious and HMS King George V. Three British carrier-based fighters (two “Seafires” and a “Martlet”) are overhead. Official USN photo # KN-20381, courtesy of the U.S. Navy Art Collection, Washington, DC, now in the collections of the National Archives.